This will be a Caregiver & Me class for littles 18-28 months of age. We will meet on Tuesday mornings from 9:30am - 11:00am. During this time we will observe our littles and explore new and fun ways to play with age appropriate toys using Montessori Methods and materials. We will have circle time, snack time as well as parent discussion time in each class. Classes will be $25 per class. ​our Play Group please contact us for more information. mixed aged group of children 2 1/2 to 5 years of age. a ​fully certified Montessori School Program. In our program your child will learn grace and courtesy as well as how to "help themselves" . Self-care skills will be an integral part of our daily curriculum encouraging children to develop self-confidence. ​ important social skills and discover what interests them. We are very excited about this program for many reasons. ​please do not hesitate to contact us at Aimee@mooziesplaycafe.com. For those of you that may be unfamiliar with the Montessori methods of teaching , the video below demonstrates a day in the life. Some of the activities shown in the video will be part of our program and your child's day. 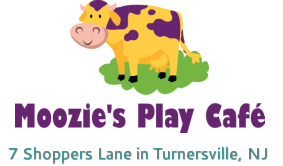 Aimee is the owner/operator of Moozie’s Play Café. As a certified teacher in Music Together and Kidding Around Yoga she utilizes her training to teach both the music classes and the Yoga programs. Aimee has an Associate’s Degree from The University of Hartford and a Bachelor’s Degree in Business Administration from St. Thomas Aquinas College. For 17 years she was the office manager for Dr. Catherine D. Nicolaides, a developmental pediatrician. During her time there she worked closely with Dr. Nicolaides to develop the practice, was an A.D.D coach assisting young adults with their transition into the working world, and worked with children with Developmental Delays and Disorders such as attention issues, autism and P.A.N.D.A.S. ​ Aimee’s most accomplished, and favorite job is the role of “mom” to her three beautiful boys. ​Our Winter Play Group AM Session will meet every Monday & Wednesday from 9:30am - 11:30am. ​will not be possible please let us know in advance. Classes may be cancelled due to inclement weather, please check your emails as well as our Home page on our webiste for updates. Play Group follows the Washington Township School District. We will make every attempt to make classes up if the schedule permits. Announcements will be made on our home page and via email. ​with you in order for them to recover as quickly as possible. Any child who is displaying any signs of illness while at play group will be asked to be picked up. A non-refundable registration fee of $115.00 is required for each enrolling child at the time of registration. Please fill out the form below to let us know if you are interested in enrolling.